Holiday Inn Downtown Yakima is a favorite among business and leisure travelers because of its great downtown location in the midst of Yakima Valley Wine Country. Rolling hills and lush vineyards characterize the area, proving a beautiful backdrop for our guests staying at Holiday Inn Downtown Yakima. 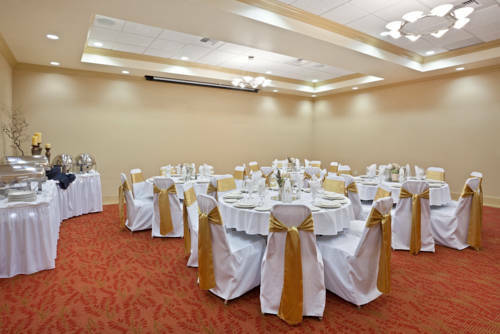 You will find easy access to event venues including the Yakima Convention Center across the street, Softball and Soccer Tournament Fields. Holiday Inn Downtown Yakima is a host hotel for the Yakima Tennis Club and Apple Tree Golf Resorts Stay and Play Packages. While you are here, check out the Yakima Greenway, a 10-mile walking and biking trail or head to the State Fair Park for our annual fair or to cheer on the Yakima Sun Kings! With over 1,500 square feet of meeting space for up to 150 guests to a 24-hour business center with print and copy services, we make your trip as convenient as possible. Complimentary high-speed, wireless internet access, allows you to send files and emails with ease. In Yakima, lodging with us means that you'll have access to an array of amenities, including an indoor heated salt-water pool, whirlpool and fitness center. Step into 8th Street Bistro and enjoy delicious American cuisine, or take a seat in the lounge and enjoy a refreshing cocktail after your busy day. Childrens's program - Meadow Brook Family Fun---7200 Nob Hill Blvd, Yakima, Wa, 98908 Go-Karts, Speed Boats, Batting Cages, Pizza Lots of Fun! 8th Street Boardroom: Our 8th Street Boardroom can accomodate up to 10 people in a private boardroom setup. Syrah: Syrah, the smaller of our two meeting rooms, can hold up to 40 people in conference, classroom, theater style setups. Merlot: Merlot, the bigger of our two rooms, can hold up to 60 people in theater, classroom, and banquet settings. Vineyard Ballroom: Our ballroom, made up of the Syrah and Merlot rooms, can accomodate 150 guests in theather seating, 125 guests in banquet rounds, and 70 in a classroom setting. Perfect for your Christmas party or wedding reception. TargetYakima's new Super Target is just minutes from the hotel. Apple Tree ResortSet in a 100 year old apple orchard, this course offers a challenge for all levels of golf. Come view the most photographed golf hole in Washington, the 17th apple shaped island green. SuntidesThis full length golf course is surrounded by private homes, a creek, and rocky cliffs. With 300 days of sunshine in the Yakima Valley, a day at Suntides is bound to be beautiful! Fisher Golf CourseThis is a par-3, 9 hole golf course. Nestled in the middle of the city, this course offers those strapped for time to still get in their round of golf for the day. Westwood Golf CourseThis 9 hole golf course is great for any day of the week. The course is on the shorter side, but rewards good shots. The covered driving range allows for hitting golf balls even if the weather doesn't allow for it! Yakima Convention CenterYakima Convention Center is located directly across the street from the holiday Inn Yakima. They have over 44,000 sqaure feet of flexible meeting space. One of the best location in the state to hold your convention! Legends CasinoWhen it comes to casino action, Legends is the best in the west. With over 1,200 slots, Vegas style table games, live Keno, and a great buffet, this casino has everything you could possibly want. SundomeThe site of state volleyball and basketball tournaments, the Sundome offers much entertainment throughout the year. The Sundome is the home of the Yakima Warriors, a member of the American Arena Football leaguee. Yakima Farmer's MarketFarm fresh produce. Stroll through they Yakima Farmer's Market with readily available Yakima Valley farm fresh produce, distinctive crafts, and products from local artisans and businesses. Yakima Valley MuseumStroll through a Neon Garden. Touch a 15 million year old tree. Enjoy a treat at a 1930s Art Deco soda fountain. Peek inside a tipi and a homesteader's cabin. This museum offers a peak into the past eras that have flourished in the Yakima Valley. Capitol TheatreNestled in downtown Yakima, the Capital Theatre serves as one of the Yakima's performing arts facilities. The completely refurbished 82 year old Vaudeville theatre seats 1500 people. Toppenish MuralsToppenish is where the west still lives. With over 70 murals, Toppenish is a great way to spend the day. Each mural depicts an event from the "west" and different events of the Yakima Valley. Gilbert CellarsGreat wine and casual ambiance combine in the historic Lund Building on Front Street, creating an experience that pleases the senses and stimulates the mind. Kana WineryLocated in the historic downtown Larson Building, twice voted "best wine/tasting room," wines of quality and value. Wine is sold by the glass and bottle. Naches Heights Vineyard and WineryWe produce Pinot Gris, Riesling, and Syrah off a high elevation, cooler climate site in Columbia Valley AVA. Join us for wines from our vineyard. Silver Lake Winery at Roza HillLocally owned and locally grown, Silver Lake is Wasington's largest consumer owned winery. Silver Lake has been producing varietal wines since 1987. Yakima Visitor Information CenterWe have all the information on the Yakima Valley a visitor might need. Want to know how to get to the wineries? Like the outdoors and need some ideas? Stop by and we will give you a wide array of things to do in the Yakima Valley.